Effortlessly collect, show and manage customer reviews with the one and only Trustbadge Reviews® Toolkit app for Shopify! Once integrated, it updates automatically. 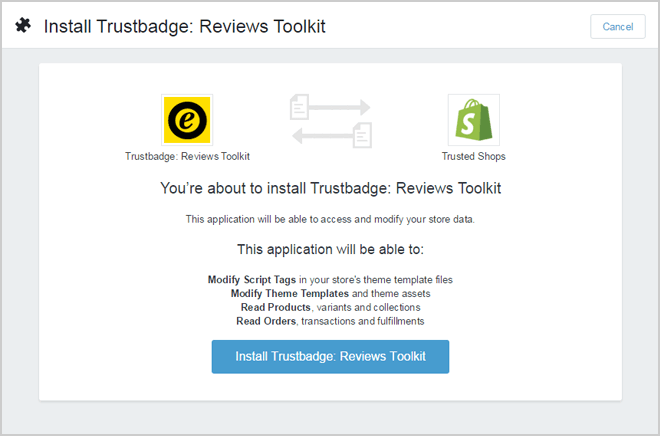 a. Click on the button "Get the Trustbadge® Reviews Toolkit" above. b. On the next page click on the green button "Get" on the right side of the page. c. Insert the web adress of your Shopify store and click on "Log In". d. If you have installed a pop-up blocker, click on "Sign in with Shopify" and leave the tab open. If you do not have a pop-up blocker installed, follow the next step. e. Confirm the installation by clicking on the button "Install Trustbadge: Reviews Toolkit"
There you are - your app is connected. What's missing are some credentials to make it work. 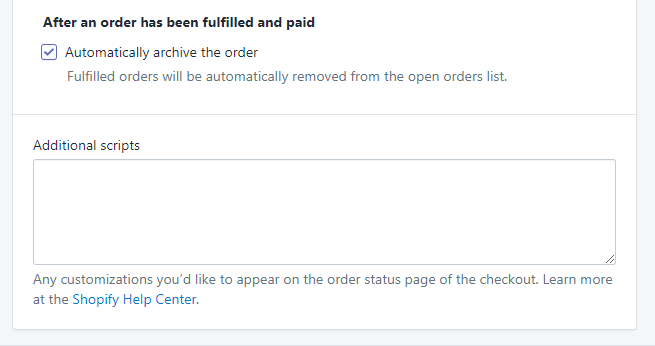 - Go to your checkout settings by clicking the blue link "Checkout Settings page" (see pictureabove). - Here it gets a bit tricky. Scroll down to the field "Additional scripts", paste it in the box below and click on "Save" in the top right corner of the page. - Then close the actual tab in your browser and go back to the settings of the Trustbadge® Reviews Toolkit app. - You can find your Trusted Shops ID in the confirmation mail after your sign up. If you don't have an account yet, it's free and easy to sign up. - Insert your Trusted Shops ID in the field "Trusted Shops ID" in step 2 "Adapt Your Trusted Shops Configuration" and click on the blue button "Save" below. h. The configuration in step 3 is optional for you. Here you can collect product reviews. - Find more information on product reviews. If your Trusted Shops plan does not include product reviews and you want this feature, get in touch with us.